If you are a parent who speaks little to no Chinese, please read this first. Parents who speak Chinese have a goal to make their kid fluent from an early age, and parents who don't speak Chinese should have a goal to give their kid an introduction to the language that will springboard into future learning opportunities. You should still give your kids Chinese TV to watch, Chinese games to play, and Chinese music to listen to. But you are also going to need structured programs that teach Chinese as a second language. Aha Chinese is one program we have found. 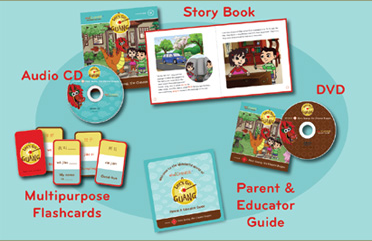 Essentially, they provide some cartoons that are mostly in English but also introduce Chinese terms, some story books that introduce Chinese culture and some Chinese words, some flash cards, and an audio CD.